At Amanwana jungle resort on Moyo island. When it comes to Amanwana, it really is almost about the journey as much as the destination. Situated on Moyo island in Sumbawa Besar, the jungle resort is just an hour’s flight from Bali in a C-208 Amphibian Cessna Caravan float plane that flies impossibly close to stunning volcanoes and dives into marshmallow clouds of brilliant white, emerging again to reveal dazzling views of rugged green slopes and picture-perfect coastlines before it lands at a backward tilt with a gentle series of splashes on the most perfectly sapphire waters. A multitude of varieties of fish are already visible as the plane pulls up to the jetty and the door opens. The beautiful island of Moyo is located just kilometres off the northern coast of Sumbawa. Since 1976 it has been a protected zone for an abundance of animal and bird life, from deer and banteng bull to wild boar, macaque monkeys, sea eagles, and osprey. The island has a population of just 3,500, residing in eight villages around the coast and subsisting through fishing, farming, and trading. Amanwana, styled as a luxury camp, has been here since 1993. Of the is-land’s 36,000 hectares, Amanwana actively manages 12,000, officially set aside as a nature reserve. 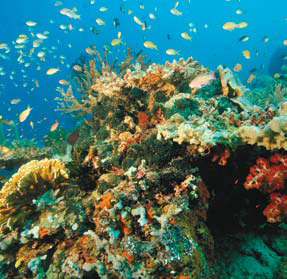 Some of the abundant marine life found in the waters around Amanwana. Moyo is truly a nature lover’s dream, offering a fascinating natural environment for exploration, with vegetation that ranges from dry savannah to dense jungle and hikes that take in a series of spring-fed waterfalls and cool freshwater pools. Its shores are lapped by the Flores Sea, in which a wealth of coral is found, from stag horn to gorgonian fans, while throughout the waters can be seen a profusion of colourful tropical fish and sometimes also dolphins, manta rays, and whales. Amanwana has its own dive centre and offers PADI certified dive courses, so divers at all levels can experience the magnificent worlds under these waters. “I’d rather be in a tent than in a house,” Mary Leakey famously said, and in tents like these, few would argue. 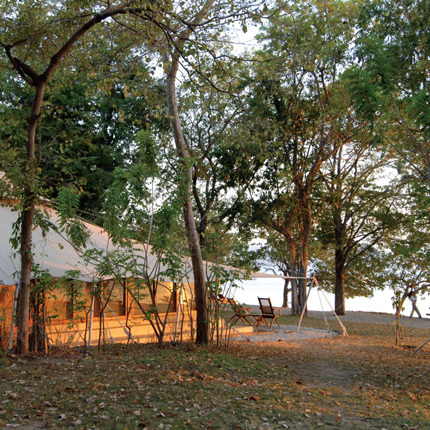 With either ocean or jungle views and linked by sand pathways under a canopy of tropical forest through which families of monkeys scramble, the resort accommodation consists of 20 luxury air-conditioned tents that are bright, spacious, and airy, each enclosed by a solid wall underneath a canvas ceiling, with teak-framed windows along the sides offering panoramic views of the surroundings. The tents are not walled off from the rest of the island, which is also a sanctuary for the indigenous Rusa deer, beneficiaries of Amanwana’s breeding programme, which has ensured a steady increase in numbers of their population. In May 2008, Amanwana created the Moyo Conservation Fund, which enables guests to contribute to the conservation efforts and community work on the island. From restoring the coral reef to building a school in the nearby village of Labuan Aji, the resort works towards protecting, nurturing and enriching the environment for future generations of islanders and visitors. These efforts also include a turtle protection project, waste recycling scheme, and education and support for stewardship of the land. At another level of community involvement, one-third of the staff is from local villages, opening up opportunities to them abroad while strengthening ties between the resort and the villages back home. A sense of this harmony with both the environment and the surrounding communities is deeply felt during a stay here. Add to this the usual impeccable Aman service and understated elegance, and you have the ingredients of an incomparable resort and a truly memorable experience.